With his tough talk and hardline stances on Iran and North Korea, President Donald Trump is damaging America’s credibility abroad – and could provoke a nuclear-arms race in East Asia, Hillary Clinton says. Trump's recent threat to decertify the 2015 Iran nuclear deal, “makes us look foolish and small and plays right into Iranian hands,” Clinton said last week. "That is bad not just on the merits for this particular situation, but it sends a message across the globe that America's word is not good," said Clinton, who spoke in advance of Trump's announcement Friday that he wants Congress and the other nations that negotiated the deal to toughen the requirements for Iran. "This particular president is, I think, upending the kind of trust and credibility of the United States' position and negotiation that is imperative to maintain." 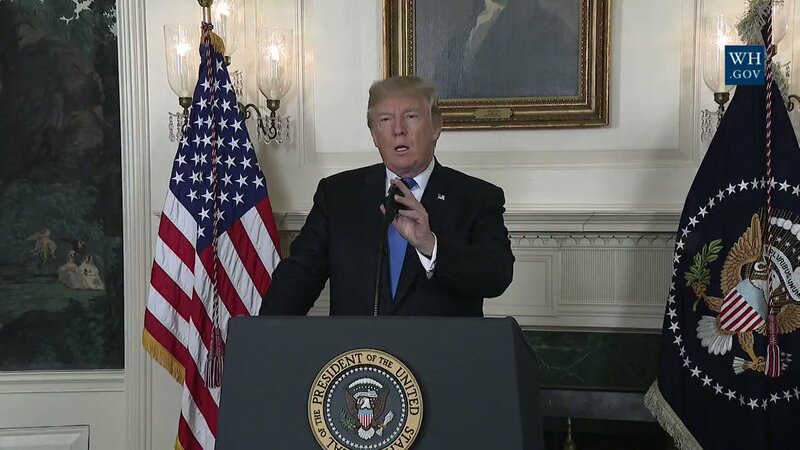 For his part, Trump says that Clinton, as secretary of state under former President Barack Obama, helped negotiate a “terrible” deal with Iran. Getting tough on Iran is the right approach, the president said. Clinton also denounced Trump's bellicose language toward North Korea, saying his verbal aggression has rattled U.S. allies. "We will now have an arms race — a nuclear arms race in East Asia," Clinton predicted. "We will have the Japanese, who understandably are worried with missiles flying over them as the North Koreans have done, that they can't count on America." Clinton stressed that a diplomatic solution was preferred, and suggested the inflammatory rhetoric played into Kim Jung Un's hands. She bemoaned Trump's public undercutting of Secretary of State Rex Tillerson when he tweeted "Save your energy, Rex" after the nation's top diplomat had suggested negotiations. “Diplomacy, preventing war, creating some deterrents is slow, hard-going, difficult work,” said Clinton, who declined to answer when asked whether Tillerson should resign. "And you can't have impulsive people or ideological people who basically say, 'Well, we're done with you.'" Trump on Sept. 21 signed an executive order calling for a new round of economic sanctions against North Korea over its nuclear and ballistic missile programs. The president said the actions were aimed at “a complete denuclearization of North Korea,” the Washington Times reported. Clinton, who recently released a book that recounts her election defeat to Trump, has been an aggressive critic of the president. Clinton made the comments when asked about the allegations of sexual assault made against Democratic mega-donor and Hollywood producer Harvey Weinstein. In the same interview, Clinton referred to the sexual transgressions of her husband – former President Bill Clinton – as being “clearly in the past,” Fox News reported. Clinton’s comments on Iran and North Korea were scheduled to air Sunday on CNN. The White House did not immediately return a request to respond to her remarks.